but for that one day, they make a grand statement! And that one single day remains with us in our hearts. Isn't it amazing when we happen to pause and get to revel in such beauty? Thank you for sharing this brilliance with us in image and haiku! Thank you Karen! Yes, for one single day, perhaps one sliver of a moment in one single day, happening all day, every day, with every movement of the Sun, Moon and Stars. That is truly one of the most awesome flowers I've ever seen! I love that you honored its short, yet magnificent, life in your haiku...very well said...and beautiful! May that day be extended into infinity. Wonderfully composed haiku. I love the photo very much. 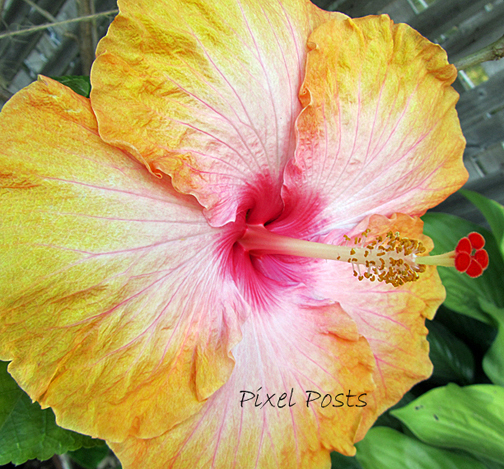 The Hibiscus just blooms for only 24 hours, it's sad, but in those 24 hours she is really a beauty. Glory. That says it all. And scintillating...I must admit, it is a new word for me. Haiku my heart fantastic with this lovely beauty. How very fortunate to have caught this beauty!! this of course is the most profound wisdom, to live each day as if it will be our last. What a beauty haiku and photo, what the heck is scintillating!? How quickly beauty comes and goes!